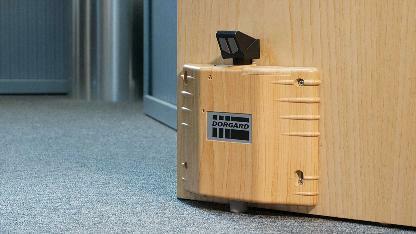 Dorgard wireless fire door hold open devices. We’ve all seen or done it before! A fire door wedged open on a hot sunny day or the fire door propped open so that people can easily pass, however it is illegal and dangerous to do this, in fact it is a direct contravention of Fire Safety regulations in the UK. In the event of a fire, this hazardous practice will result in the fire spreading quicker, causing more damage and putting people’s lives at risk. Dorgard enables you to legally and safely keep fire doors open, by allowing the door to close when the fire alarm sounds preventing the spread of fire and smoke. Installed onto the bottom of the fire door in under 5 minutes, Dorgard is listening for a continuous fire alarm of 65dBA or higher.